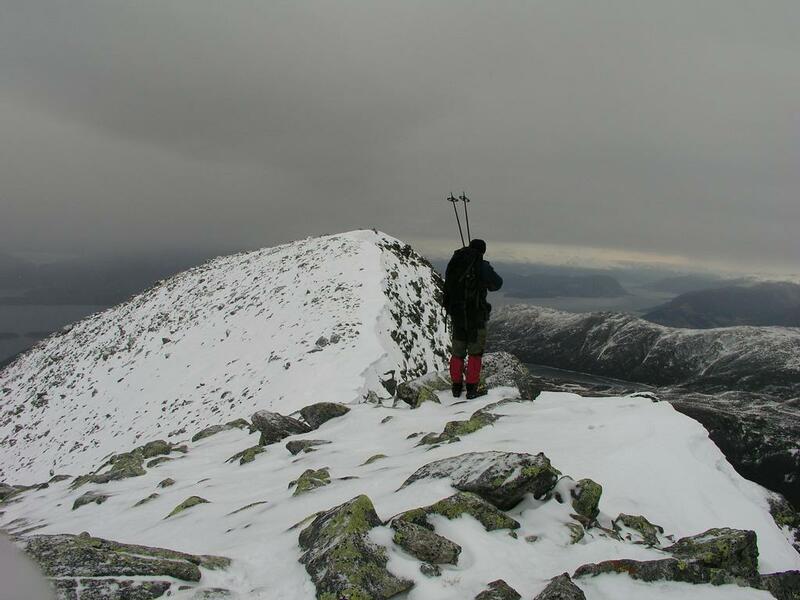 How to get there: The mountain is south of Rosendal with best access from the valley Uskedalen. One should drive to Gjermundshavn where a ferry crosses to Årsnes (previously Løfallstrand) in Kvinnherad. The drive from Bergen to Gjermundshavn is approximately 1.5 hours. Once in Løfallstrand, drive south (right) through the small village of Rosendal, continue along the fjord to Dimmelsvik and further (still along the fjord) to Uskedalen. Make a left onto a paved, single lane road going up Uskedalen to Musland. After about 2.5 km you pass the farm Haugland on your left, find the first road that exits right after this farm. This road is closed by a gate just as it crosses the river, park off the road near this point, there is space for 2-3 cars right at this spot. If you locate the forest road that exits left you have gone too far. The elevation at this point is 80 meter. Route description: Cross the river (as well as the gate) on the small road. First, this road parallels the river south, but soon thereafter it makes a bend to the right and climbs gently towards the lower part of the distinct ridge that comes down from Geitadalstind. The road ends near the creek that runs down Bergsdalen, the valley between Ulvanosa and Englafjell (1200m). You are now at 120 meter above sea level, only 1090 more vertical meters. There is a sign for Ulvanosa and a clear trail that heads up along the lower part of the ridge. The trail is well marked and first climbs to Veslanosa, 540 meter. Higher up the trail is marked with red "T"s, there is a sign indicating a direct trail to Ulvanosa as well as an alternate trail to Geitadalstind. 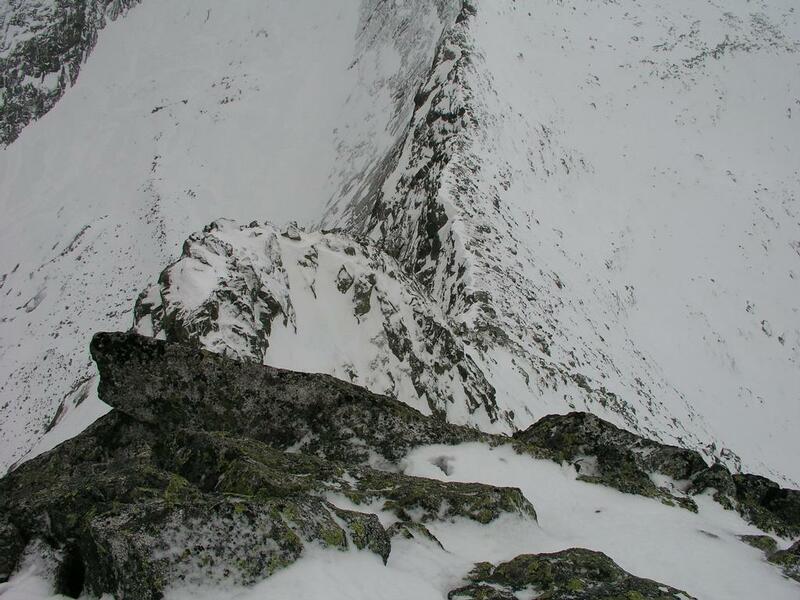 From this very nice summit (1210m), continue south in order to also visit the slightly lower south summit. The straight line distance from the north to the south summit is 233 meter with a vertical drop to the saddle of approximately 20 meter. If Geitadalstind is the only objective, then return the same way. Alternatively, continuation along the very top ridge to the summit of Ulvanosa (1246m, 1.2 km south) is likely to require a rappel down the upper, steep section. One can however, descend a bit to the west, then contour left and regain the ridge. 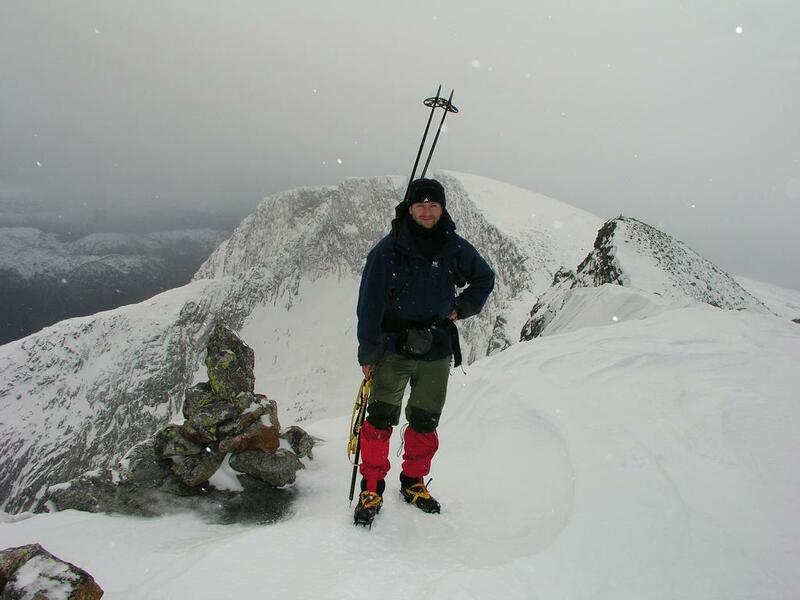 Comments: I did this hike with Arnt Flatmo and my son Pål Jørgen, age 13. This hike also included Ulvanosa (1246m), see this entry for a more complete description. We climbed slightly left of the (NW) ridgeline that points towards the T-marked approach trail from the north. 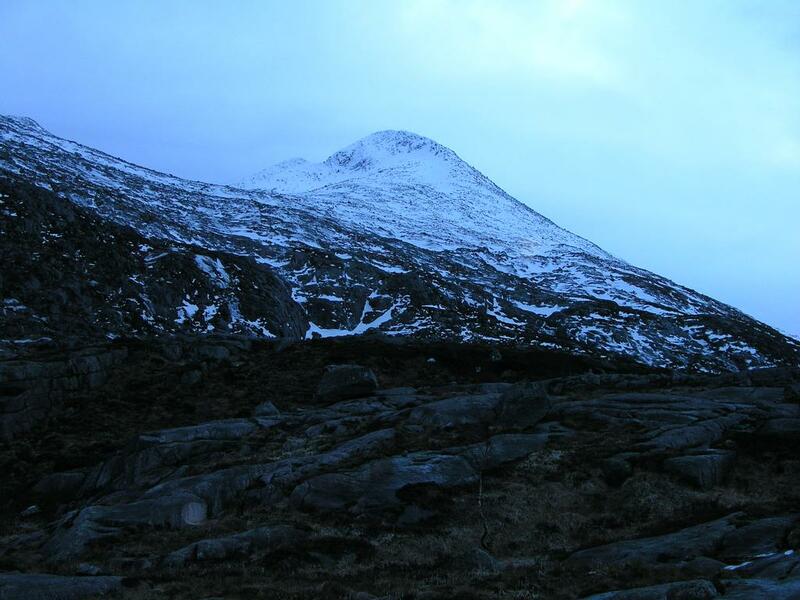 We subsequently traversed to the south summit which is slightly lower. It took us approximately 4 hours to reach Geitadalstind, including several stops for pictures and food as well as crampon adjustments. The elevation of this peak is not explicitly stated on the map, my GPS read 1210 meters, while the Ulvanosa reading was 1250 meter. This GPS only displays altitudes to the nearest 10 meter. An elevation of 1210m is consistent with these measurements. The contours on the map verifies a summit area (for both summits) above 1200 meter. A small "dot" (inside of the 1200 meter contour) may indicate that the north summit is 1220 meter, but this is not supported by our GPS readings. Note that we did this hike at the very end of December with minimal, but very stable snow conditions. 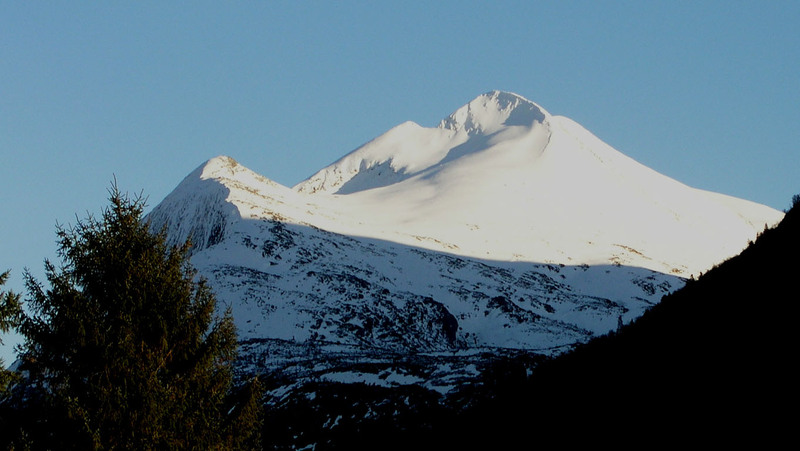 This mountain area may have avalanche conditions with a deeper snow pack, make your own careful judgement. Also, the east side of the mountain is very steep, the snow will form overhanging cornices, watch your steps. Geitadalstind, picture taken from the road on April 5. 2003. Geitadalstind, seen from the trail. 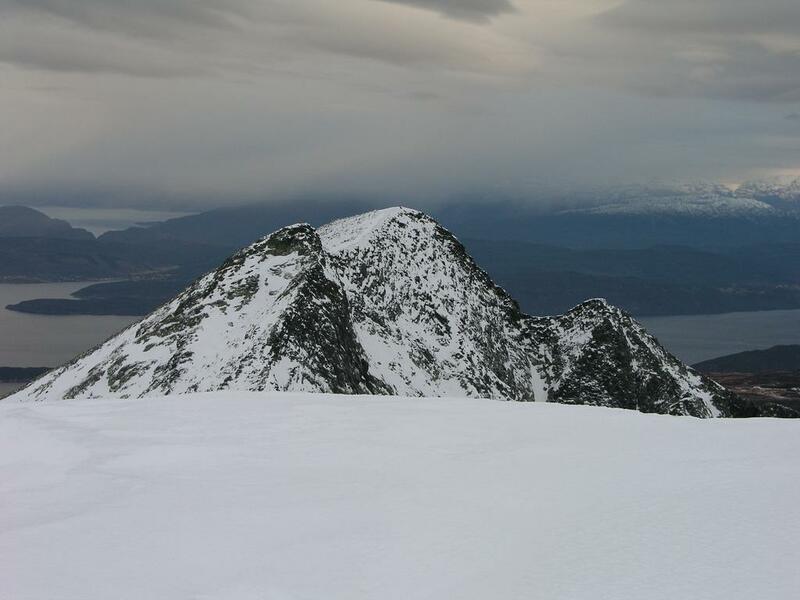 Arnt on Geitadalstind, the south summit and Ulvanosa behind. 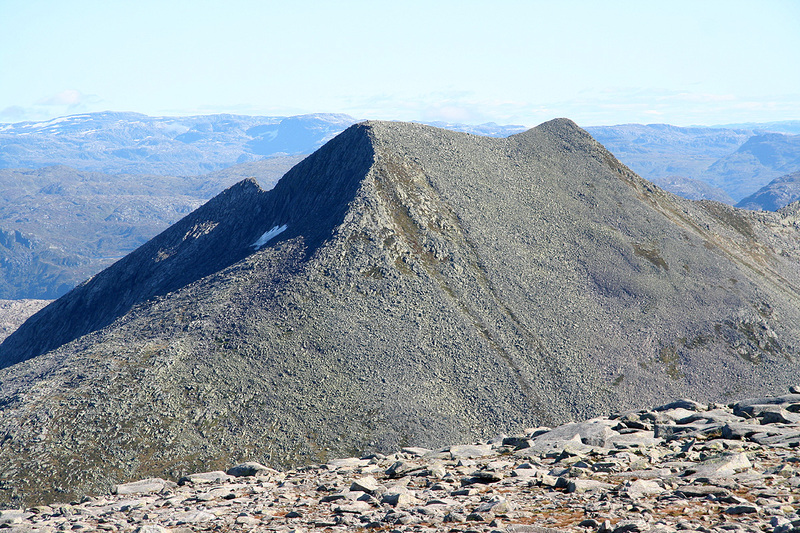 Geitadalstind, as seen from the south summit. The ridge from Geitadalstind towards Ulvanosa. 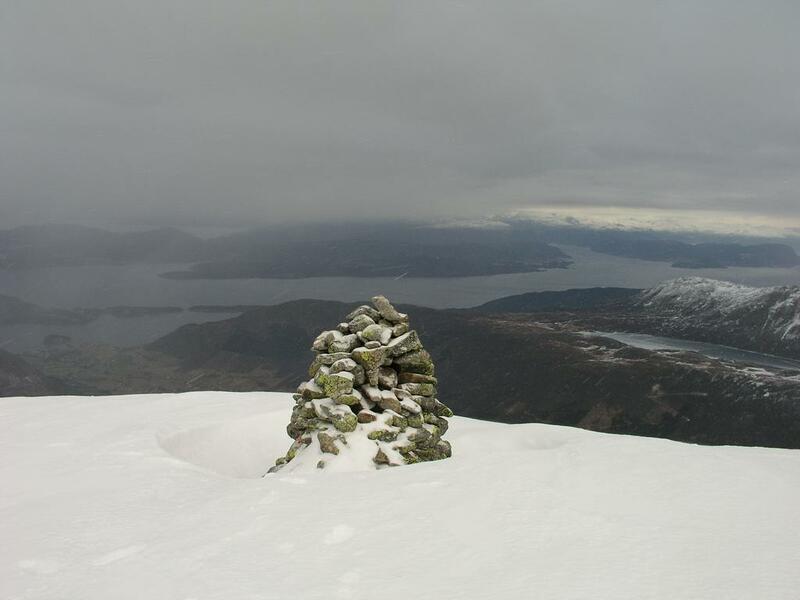 Geitadalstind, as seen from Englafjell on September 13, 2009.